To move to a post-carbon world, says David Orr—a place where we no longer borrow from the health and prosperity of our future—work needs to happen on many fronts. "The task of today’s leadership is to bring us to our senses,"he says. "We have already committed to a future that has a lot of disaster in it. But we have not yet committed to catastrophe, the point where it is all over." There is hope, he says, but not in the numbers. The hope is in the people—change agents committed to rethinking a world that is deeply influenced and affected by climate change. Around the country, Oberlin alumni are leading that charge, learning to balance conservation with radical change, consensus with a need for action, and knowledge with optimism. Their work is truly the hope of future generations. Late last summer, Sadhu Aufochs Johnston ’98 invited me to take a walk on a roof. On it, tall grasses and plush low plants edged a short, winding path made of stone. In the distance, bees darted around stacked wooden boxes that were fashioned into hives. Butterflies and dragonflies danced above raised wildflower beds. The space was calm, and Johnston relished it. He could have stayed all day, but he was late for his next appointment, a TV appearance on a gardening show being filmed atop the Chicago Cultural Center. 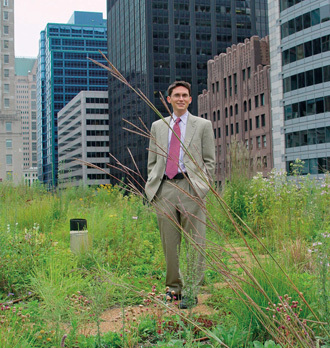 Today, more than a year later, Johnston is still walking on Chicago’s green rooftops. There are more of them now—proof that his ultimate goal is within reach: "to help Mayor Richard Daley make Chicago the greenest city in the nation." Johnston and Daley first crossed paths five years ago in Cleveland. As founder and executive director of the Cleveland Green Building Coalition, Johnston took Daley, a longtime proponent of green initiatives, on a tour of Cleveland’s first green commercial building. It was a former bank, nearly 100 years old, that had been retrofitted with energy-efficient lighting, solar panels, geothermal heating and cooling, and a green roof. Daley was so impressed that a month later he offered Johnston a job as his assistant for green initiatives. Today Johnson is Chicago’s chief environmental officer, the first position of its kind in the nation. His long-term goal? To build a sustainable city. With growing concerns about climate change, Johnston is proud to have led the Chicago Climate Action Plan—26 strategies for reducing greenhouse gases and nine actions to prepare for climate change, all in an effort to reduce the city’s carbon emissions by 25 percent below 1990 levels by the year 2020. The plan builds on the staggering amount of activity already in place. The city planted 500,000 trees to help counteract air pollution generated by cars, for example, and built 150 miles of bike paths and lanes. Chicago generates more than two megawatts of solar capacity and buys more than 20 percent of its electricity from renewable sources. The city also installed five alternative fueling stations that pump ethanol, biodiesel, and compressed natural gas, and bought hundreds of city vehicles that run on them. Chicago has more green roof space—518,000 square feet—than any other North American city, including a garden atop city hall. It’s the country’s first municipal green roof, and has saved the city about $25,000 in energy costs. The city also leads green efforts in the business world. A Waste to Profit Network analyzes the input and output of waste materials so that companies can reuse each other’s excess. The pharmaceutical company Abbott Labs, for example, needed to dispose of about 200 drums of concentrated chlorine—a costly venture. Mittal Steel stepped up and put the chemicals to use in its water treatment facility. "It’s great to have someone in a high position advocating for environmental issues,"says Johnston, of Mayor Daley. "It communicates to people that this is a top priority. "But our toughest challenge is getting people to try new things and to think about how and what they use,"he adds. "In order to do this, we try and create programs that engage them. "A green permit program, for example, expedites building permits for developers who incorporate green building strategies. Homeowners can apply for green roof grants to retrofit their roofs. A test-run of a new fleet of public, diesel-electric hybrid buses is also under way. Even hotels—30 in all—are getting green makeovers. At home, Johnston practices what he preaches. He and his wife, Manda Aufochs Gillespie ’97, were dubbed "Chicago’s first family of green"by the Chicago Tribune last year. Johnston bikes 10 miles to work and back, leaving his fuel-efficient car at home. Their house has no central air conditioning, their lawn mower is powered by old-fashioned muscle, and their basement is home to a worm-composting pile. After the birth of their daughter last year, the couple threw a "hand-me-down"party to welcome used clothes, books, and toys from their friends. "It’s about lifestyle,"Johnston says. "I want to demonstrate to cities all over the world that we can decrease our impact on the environment while saving money and improving our quality of life." 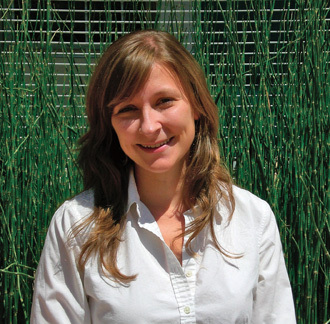 Buildings account for 39 percent of our country’s total carbon dioxide emissions; Lindsay Baker ’04 is working to reverse the trend. After graduating from Oberlin, she landed a job at the U.S. Green Building Council, the nonprofit organization that created and administers the LEED building rating system. LEED (Leadership in Energy and Environmental Design) is the nationally accepted benchmark for the design, construction, and operation of buildings that minimize energy use and maximize environmental benefits. "I was attracted to the green building movement because of how hopeful and constructive it is," she says. "It takes on the larger issues of environmental degradation and creates solutions in a practical way." LEED certification, which involves a rigorous third-party commissioning process, offers four levels of certification—certified, silver, gold, and platinum—for new construction projects. Each corresponds with five green design categories: sustainable sites, water efficiency, energy and atmosphere, materials and resources, and indoor environmental quality. When Baker came aboard, the Green Building Council was a start-up organization with a staff of 30. Its staff size has since quadrupled. During that same period, the number of LEED certified building projects rose from 100 to 1,750—with 14,000 more now in the works. Baker, who coordinated the LEED for Schools program, tells the story of visiting the first LEED platinum school in the country, where an 11-year-old student gave her a tour. "He excitedly explained how the solar panels and rainwater harvesting worked," she says. "It melted me. I was really [moved] to see this little kid who was so fascinated by how his building worked and who felt so happy and privileged to be there everyday." After several years of shaping green building policy, Baker returned to her true love —the bricks and mortar of green building. She’s currently at U.C. Berkeley, pursuing a master’s degree in building science. Some environmentalists say that Claire Jahns ’03 is a sell-out; others call her a hero. Currently a year into a combined graduate degree program in environmental management and business at Yale, Jahns spent four years as an economist with the Chicago Climate Exchange (CCX), working in the business of carbon emissions trading and compliance. Simply put, emissions trading—also referred to as cap-and-trade—creates economic incentives to not pollute. The government sets a cap on how much of a pollutant can be emitted. A company must then cut their emissions of that pollutant to meet the standard. If a company can exceed that standard, emissions trading allows them to sell the difference to a company that is polluting too much. In other words, one company makes money by conserving extra, and the other company pays to pollute more. "I hate math; I never thought I would go into economics," says Jahns. "But the economics classes I took at Oberlin seemed to offer so many practical tools for possible solutions to environmental problems." The EPA’s acid rain program is one emissions trading plan that particularly impressed Jahns. Created in the mid-’90s to reduce the levels of sulfur dioxide and nitrogen oxide in our atmosphere, the program primarily targets coal-burning power plants, allowing them to buy and sell emissions allowances. "The acid rain program is considered the most successful environmental program in history," Jahns says. "It ended up costing power companies a fraction of what they thought it would. Acid rain is no longer a problem, and it didn’t greatly increase energy prices—proving that market-based environmental solutions can be easy and benefit everyone." The same possibility exists for carbon, says Jahns. But because carbon dioxide emissions are not capped by the federal government, companies have little incentive to reduce. Companies that join CCX sign a voluntary, legally binding pledge to cut their emissions to predetermined rates, and are rewarded financially for doing so. When Jahns first joined CCX, there was no defined price for how much not polluting was worth. It was CCX that created a market, and thus a price, for carbon. Today, states and regions are pursuing cap-and-trade programs of their own. Jahns says she looks forward to seeing companies who have worked with CCX "take off their voluntary market training wheels and assume their place at the head of the compliance pack. "The way the environmental movement is shaping up, once-crazy ideas aren’t so crazy anymore," she says. "At CCX, when we first put a price on carbon, people just responded. I worked with a power plant that ran off of algae. It sounded kooky at first, but those are the ideas that can help solve problems. "Climate change is the measuringstick by which all else will be measured," she adds. "It is going to impact everyone." 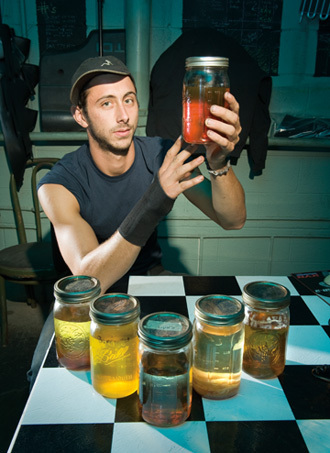 Sam Merrett ’05 is considered Oberlin’s go-to guy for alternative fuels. Outside of his Oberlin service station, Full Circle Fuels, rests a strange mixture of vehicles: an ambulance, a bus, and an old Volkswagen. Inside, engines are being converted to operate on straight vegetable oil. This is not biodiesel, but simply cooking oil. The station has two pumps selling blends of biodiesel and vegetable. Merrett describes himself as the student who was always looking for reasons not to be in class. "Call it a commitment to service learning projects," he jokes. Early on, he explored energy issues, particularly those with an Oberlin community bent: teaching high school students about energy and math; creating a community-scale biodiesel processor; and using an American Public Power Association Scholarship to research the use of biodiesel in generators used by the local power company. Later, he earned funding from the EPA and a Compton Fellowship; both helped him open Full Circle Fuels in what had been an abandoned service station in downtown Oberlin. These days, Merrett’s shop draws customers from all over Ohio and beyond. He and his team have converted 180 diesel vehicles to run on vegetable oil, and more have been converted through Merrett-taught workshops. Some of his customers are environmentalists, he says. Others just want to save money or seek the ultimate independence from fuel. Already in Oberlin, waste oil from the College and from town restaurants power everything from a restaurant delivery vehicle to a greenhouse. "Until the 1950s, the U.S. produced nearly all the petroleum it consumed," Merrett says. The call for increased energy independence is resulting in new demands for biodiesel and ethanol. But along with those demands is criticism—worries about the strain on land resources and food supply related to biofuels, which rely largely on corn and soybeans. "This criticism is good," Merrett says. "It’s not smart to convert everything over to one alternative. The answer is to pair the proper solution with the proper use—and to focus more on behavior." In other words: drive less. Not many service station owners will tell you that. The founding partners of Lucid Design won big at the California Clean Tech Open. Not many years ago, Michael Murray ’04 walked into the Environmental Studies Center at Oberlin and fell in love. The object of his passion? A computer monitoring and display system that tracked the building’s energy use. "It looked like hell," says Murray, "but I was fascinated with it. It was a handmade wooden thing with an ancient laptop running a buggy application that crashed all the time and a needle that charted energy use." These days, Murray works with a variant of that same monitoring system. He and two other Oberlin alumni—Gavin Platt ’06 and Vladi Shunturov ’05, along with their former faculty advisor, Associate Professor John Petersen ’88—are founding partners of Lucid Design Group, a nationally known company behind the web-based technology that provides real-time feedback on electricity and water use. The commercial appeal is simple: by allowing people to monitor their use of energy, they will be motivated to conserve it. What the foursome has now is Building Dashboard, a proprietary software that "un-locks" a building’s automation and metering systems to display real-time information on energy and resource use. While many commercial buildings have metering devices, such as electric submeters, most do nothing more than generate a monthly bill. Building Dashboard opens up real-time communication with these devices and displays the information online in a way that makes sense to a layperson. The student’s early guinea pig was Oberlin’s Lewis Center, where monitoring the energy use was easy. The team struggled, however, with ways of displaying the information being gathered. Off-the-shelf, third-party software was available, but the final result was often hacked together and cumbersome. A better idea, the group realized, was to create their own software—something that would translate the monitoring information into a product people could use and would want. The student team got a big boost in 2004 and 2005 by landing two major awards in an EPA student sustainability design competition. The $85,000 prize allowed the team to expand the monitoring system into Oberlin’s residence halls. Around that same time the group incorporated Lucid Design—and was immediately overwhelmed by clients. All but Petersen work full-time with the company in Oakland, California. 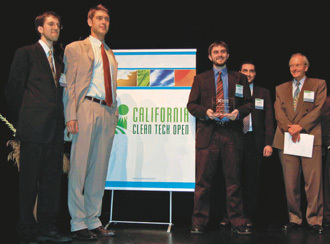 Lucid garnered more big-time recognition in 2007 as the grand-prize winner of the California Clean Tech Open. Today, clients range from colleges and museums to such corporate giants as Yahoo! and Wired magazine. The monitoring system also had a presence at the Beijing Olympics, as part of a Future House that showcased sustainable energy and building practices. At Oberlin, to which Lucid donates significant time and software, it is no longer just the Lewis Center being monitored. On campus, 26 student residences have monitoring systems, some with floor-by-floor feedback. "Oberlin holds the record among all of our clients for the greatest short-term reduction of electricity usage," says Murray. Whereas most clients see a 10 to 20 percent energy savings, Oberlin has experienced a 56 percent savings—and, unlike most of Lucid’s clients, students on campus don’t have utility bills to motivate them. "We don’t tell people how to save energy or to turn off their lights," says Murray. "People want to take more ownership of their own consumption, and this system is a tool that gives them immediate feedback on their behavior." The average piece of food in America is transported more than 1,300 miles from origin to plate. Sandi Kronick ’01 has been thinking about food—where it comes from and its impact on people and the planet—since her student days. At Oberlin she was the local foods coordinator for OSCA—a job that changed her life. Today she is cofounder and CEO of Eastern Carolina Organics (ECO), a marketing and distribution service for organic fruits and vegetables gown locally. Right out of Oberlin, Kronick went to work as a sustainability consultant for the Great Lakes Brewing Company in Cleveland. Getting local, organic foods from farmers to the consumers was no easy task. "There was a huge demand for a middleman, but one that was environmentally conscious and fair-minded," she says. Soon after, she moved to North Carolina, setting out to become that middleman. 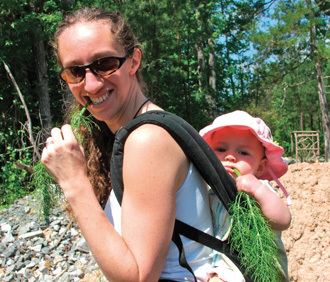 While visiting a farmers’ market in Carrboro one day, the first farmer she met—coincidentally an Oberlin graduate—connected her with the Carolina Farm Stewardship Association, a non-profit umbrella organization for sustainable agriculture. Soon after, Kronick landed her first grant: $48,000 in tobacco settlement money used to help retrain tobacco farmers to diversify their crops and meet a rising demand for wholesale vegetables. Many potential customers wanted to buy large volumes and consistent supplies of organic, locally grown produce, but they lacked the time and resources to source the food. The farmers, meanwhile, needed help marketing and distributing their produce. "I would literally get into these farmers’ trucks and show them how to get to the back door of a restaurant, tell them not to show up at lunchtime, and explain what an invoice was," she says. Launched officially in 2004, Kronick’s company distributes and markets produce for 40 farms across North Carolina, selling directly to 18 grocery stores, nearly 50 restaurants, 10 corporate cafeterias, and 10 distributors. ECO shares ownership with 17 farms; 80 percent of the profits are returned directly to the growers. Kronick tells the story of a farmer, a man who came from a long tradition of farmers and was raised to farm himself. When his children grew up, he insisted they train for something else, as he could see no future in the family’s farm. With ECO’s help, however, the farmer converted his entire 1,000 acres to organic farmland and is training his nephew to take over. "That one anecdote makes it all worthwhile," says Kronick. Brad Swing ’83 took a circuitous route to his job as director of energy policy in Boston’s Office of the Mayor—beginning with a double degree in voice and history at Oberlin and an honors project in Byzantine intellectual history. "I’m the product of a liberal arts education," he says. "The process of learning how to learn was great preparation for working in policy." Swing was doing waterfront planning for Boston Mayor Thomas Menino in 1998 when he dropped in at an Oberlin regional alumni event. David Orr was speaking about Oberlin’s proposed environmental studies center. "Hearing David talk, and then reading about the project in the alumni magazine allowed me to facilitate an internal work connection," Swing says. The city of Boston had received a $2.2 million grant that had to be used to develop a green building. Simultaneously, the Massachusetts Audubon Society was looking to create its first urban nature center and wildlife sanctuary. Swing connected the two and helped facilitate Boston’s first green municipal building: the George Robert White Environmental Conservation Center. Menino is a "bread and butter mayor," says Swing, one not prone to prioritizing an aggressive green building project. One simple detail—that fact that Swing’s office was located in between the mayor’s speech writers and the press office—allowed him to push green building into "the day-in and day-out calendar of the mayor’s life." Oberlin, says Swing, became an important guide. Project managers adopted the Lewis Center’s theme: a building that teaches. They did a design charrette and brought in Orr as a keynote speaker. The project’s success helped Swing convince the mayor that Boston ought to play a national leadership role in energy policy. The result? Boston became the first major municipality in the U.S. to require LEED standards in private building construction. The newly renamed Mayors Office of Environmental and Energy Services helps developers understand how buildings relate to the grid and their potential to generate and distribute energy. In 2007, the city launched a $2 million program to green its stock of affordable housing and install solar panels on six buildings. All affordable housing funded by Boston’s Department of Neighborhood Development must now meet LEED standards and be deemed "solar-ready." The city has also developed a climate action plan that aims to reduce emission levels to 7 percent below 1990 levels by 2012. This winter will be a test for many cities, says Swing, as the elderly and poor in many places will be forced to choose between heat and food. But it is also an opportunity "to break down the silos of traditional policy discussion because of the crisis we are in." 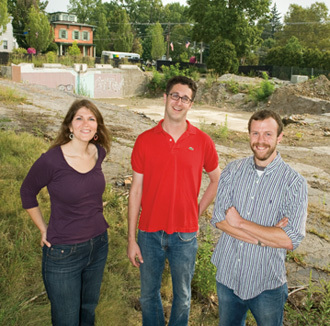 It’s been seven years since Ben Ezinga ’01, Naomi Sabel ’02, and Joshua Rosen ’01 first saw with new eyes the cracked cement and vacant facade of an old Oberlin Buick dealership. It’s been seven years of planning and politicking to get where they are today—the eve of breaking ground on a $15 million, LEED gold, mixed-use development complex intended for Oberlin retailers and homeowners of all incomes. The trio was barely out of college in 2001 when they first saw "opportunity" in a parcel of vacant land just a few blocks from campus. "What could this site do for this downtown and the people of this community?" they wondered. The first answer was simple: a community center. The town’s leaders, however, had other ideas—a development, perhaps, that could address Oberlin’s stagnant retail sales and lack of affordable housing. As their vision grew, so did their debt. The young alums maxed out their credit cards, took out options to buy the car dealership and adjoining properties, and paid for preliminary architectural drawings. Soon they attracted an important ally, alumnus Richard Baron ’64, co-founder and CEO of the St. Louis development firm McCormack Baron, who added significant human capital to the project and provided hard-to-get New Market Tax Credits. Scheduled to break ground this fall, the 70,000-square-foot East College Street Project will offer 32 condominiums—each equipped with an energy monitoring system —as well as retail, office, art gallery, and studio space. A separate building will serve as a live-work incubator for emerging entrepreneurs. A true community venture, the project marks a lot of firsts—the first large-scale development for the young developers; the first major development in the city of Oberlin in decades; and the first private project to actually gain funding from the city—specifically, $1.4 million in upgrades to the public infrastructure surrounding the building. The project is also slated to be one of the first green mixed-use developments in the Midwest and among the first in the nation to join a new LEED category of neighborhood projects. "The building will allow people to live their values," says Ezinga. Such a development isn’t as easy, nor as profitable, as a big box store outside of town or a luxury condo complex anchored by Starbucks. But it’s the kind of development that appeals to many Oberlin residents and is "incubated, mentored, and built by Oberlin alumni." In fact, alumni make up a large portion of the condo-buying waiting list. The improbability of three recent college graduates pulling off a project this immense is hard to comprehend. Says Sabel, "It’s an issue of size. It was a scale in which three people could make waves and have a significant impact." Rosen adds, "Oberlin College develops the type of person who has the nerve to pull off a $15 million real estate project right out of college. The Oberlin community is forward-thinking. This couldn’t be done in a lot of other places. You don’t have to be an environmentalist to realize the urgency of the environmental situation today, just a critical thinker." "I’ve spent my entire career trying to communicate the impacts of industrialization on human beings," says environmental scientist and engineer Sylvia Hood Washington ’80. She and other scientists are now learning that exposure to air pollution can actually alter human genetic material. In some communities, therefore, children are not just harmed by lead and other pollutants, their genetic material can change too, ensuring that future generations will also be affected. This lack of clean air—when it occurs in regions or neighborhoods populated by low-income, ethnic, or minority groups—is what social scientists refer to as environmental injustice, or the unequal distribution of environmental hazards. Washington and other proponents of environmental justice not only work to do away with the hazards, they also fight for equal distribution of the benefits—things like access to nutritious food, clean water, recreation, health care, education, and even for equal weigh-in on policies and decisions that affect the environment. "Some environmental justice scholars aren’t happy with the climate change movement for the same reasons they weren’t happy with the mainstream environmental movement," says Washington. "’Reduce, reuse, recycle’ is what most [mainstream] environmentalists are looking at—not at environmental health issues." Climate change, she says, disproportionally affects poor and minority communities in three distinct ways: heat, flooding, and infectious disease. "Pollution is color-blind. If you want to see what climate change is going to do to the rest of our country, just look at the minority and poor communities that aren’t protected," she says. "We ignore these communities at the peril of the rest of society." An active researcher, instructor, and writer, Washington is editor of Environmental Justice, a provocative new journal that addresses issues of environmental inequality—from transportation problems related to evacuating New Orleans prior to Katrina to coverage of a community program in East Buffalo that cleaned up a contaminated waste site. With many books and even a film under her belt, Washington seems almost modest in revealing what she finds most fulfilling: talking with people—learning their histories and teaching them about the effects of industrialization on their health and lives. As she says, "Environmental equality means healthier people and healthier communities." Manda Aufochs Gillespie ’98 is a Chicago-based writer and founder of www.thegreen mama.com. Just 18 miles south of Oberlin, 1,000 acres of farmland will be forever preserved, thanks to a long lineage of Oberlin alumni raised on the concept of giving. 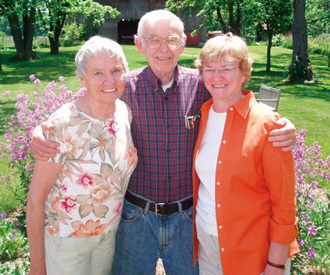 In 2007, a trio of siblings—the fifth generation of the Babcock family and Oberlin alumni all—waived any future development rights on their property, which is home to woodlands, rolling pastures, and tillable acreage. Siblings Jarvis Babcock ’53, Alice "Weezie" Babcock Bradley ’54, and Catherine Babcock Leary ’65 said the decision came easily. The preservation was made possible in part by the Ohio Department of Agriculture, which granted an agricultural easement to 949 acres of land co-owned by the siblings. Jarvis donated a conservation easement to the Western Reserve Land Conservancy on an adjoining 69 acres. The siblings received about $100,000 for the easement and the priceless assurance that their land will remain farmland in perpetuity. "Was it the ’right’ thing to do?" pondered Jarvis in his family’s annual holiday letter. "In our hearts and minds we are sure it was: A good part of the farm has been in the family since 1832, and our generation has the last, best chance to keep it as a farm." Andy McDowell, a field director for the Conservancy, calls the Babcocks’ actions "monumental and a milestone in farmland preservation," owing to the large size of contiguous land and the fact that it was the largest amount preserved in Lorain County to date. Although the land may be farmed, it can’t ever be developed. That sits well with the siblings, whose family stories weave together fond memories of the land and a love of learning. Catherine, who now lives in Wisconsin, recalls riding with her father in his pickup truck one day when she was 7. He pulled the truck over onto a spot the family knew as Happy Valley. Catherine walked down the hillside with her father into a densely wooded area, where they stopped and sat on a fallen log. Pointing out trees and the sounds of various birds, her father remarked, "I come here to find what your mother finds in church. All you have to do is sit quietly in these beautiful woods. But in case your mother is right, I want you to keep going to church every Sunday." The Babcocks’ lives were filled with hard work. Parents Eugene Ford Babcock ’17 and Esther Shelton Babcock ’21 made it clear that higher education was a must. "We could go to college anywhere we wanted to, as long as it was Oberlin," says Alice, who now lives in Boulder. The family, in making their decision to preserve the land, issued a statement: "All of us feel very privileged to have grown up on the farm. As our mother, Esther, would say, ’It isn’t what you are given, but what you do with it that is important.’"
"We just did what was right in our hearts and minds to preserve the farmland," says Catherine. "At Oberlin you learn that life is not just to be a business person accumulating wealth, but doing as much as you can and giving back. Our hope is that this will be a path that others will follow." “This organization is my answer to the question: How would you create a more sustainable city?” says Peter Nicholson ’91, founder and executive director of Foresight Design Initiative, a Chicago-based non-profit that aims to “improve and sustain” the quality of life in an urban environment. Tapping into a large community of dynamic, eco-conscious young professionals in Chicago, Foresight hosts green-themed workshops and networking events, serves as an information hub, and undertakes a range of sustainability-related innovation projects. The goal, says Nicholson, is to foster greater demand for sustainable solutions among the public, to empower the business community to provide them and to pursue innovation through Design. “As our motto says, it’s about ‘evolving better’ through the synergistic combination of community building, education, and implementation. The Chicago Sustainable Business Alliance, for example, was created by Foresight to connect and support companies aiming to fit sustainability principles into their products, services, and practices. Similar to that is the Chicago Green Business Directory and a Sustainability Hub Email list, which collects and posts information about green-related events, jobs, and news in the city. But perhaps most popular is Chicago Green Drinks, an informal, bimonthly networking event billed as an opportunity for the local sustainability community to socialize and learn from one another. Sandwiched between cocktail and socializing hours is an adeptly moderated panel discussion on some green issue, such as philanthropy and the environment, or Chicago’s food policy issues. Nicholson is also the founding principal of the organization’s burgeoning design practice, the Foresight Studio. Undertaking a range of projects generated both internally and by external clients, the Studio has done everything from create websites, to realize large exhibits installations, to research Green Collar Jobs, to consult on a statewide land conservation project, all from a sustainability perspective. Its clients have included leading green architects, local government departments, and foundations, among others. Eric Lohan ’97 considers himself the plumber of the environmental movement. As a project manager at Worrell Water Technologies in Charlottesville, Va., he researches and develops Living Machines—engineered systems that use natural ecosystem processes to treat water. Worrel works in three areas: living machines, water security systems for government installations, and developing an alternative to chlorine. Lohan didn’t plan on an “eco-sewage” career. Early on at Oberlin, he says, he had a defensive, Earth-First! attitude toward solving environmental problems. Classes with David Orr and an introduction to ecological design helped shift his thinking: instead of trying to “stop the bad,” he says, he thought more about proactive solutions for improving living systems. Intriguing to Lohan was the developing technology of wetland-based wastewater treatment. Living Technologies, the designer of the Lewis Center’s living machine, was offering an internship. “I just got sucked in,” Lohan says. He went on to earn his master’s degree in the field and has since developed systems throughout the world. 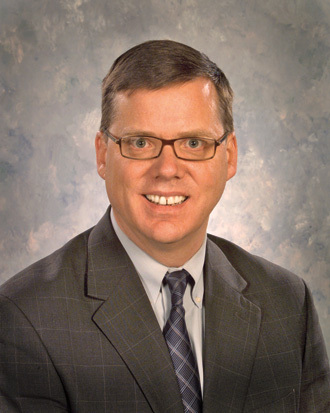 He has co-authored five patents on ecological wastewater treatment and has worked with clients ranging from the State of Vermont To the Port of Portland Airport.